Design solutions from light storage to heavy-duty production structures. All structures bolt together for ease of assembly. 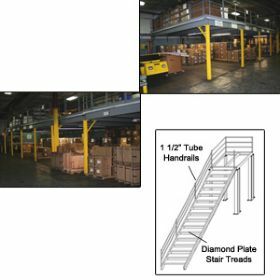 Smart Space Mezzanines heavy-duty standard designs include advanced features such as diamond plate stair treads for sure footing and 1-1/2? handrails. All structural steel components painted with a gray prime coat finish. Durable flooring consists of Â¾? T&G plywood over 22 gauge deck for support of 125 lbs./sq. ft. uniform load, L/360 deflection. Meets BOCA, OSHA, SBC, UBC and IBC codes. Custom sizes and specifications available ? contact dealer for details. FOB Shipping Point. Bar grating treads or deck. Diamond or smooth plate decking. Custom stair and landing layouts. H x W x L Wt. (lbs.) Price Ea. Custom sizes and specifications avilable -- contact dealer for details.